Veronika Alexander earned her PhD in economics with a focus on neuroeconomics at Claremont Graduate University. She is currently a Koch Foundation Postdoctoral Research Fellow and a Senior Researcher at the Center for Neuroeconomic Studies working under Paul Zak, as well as a Research Scientist at Ofactor, Inc. She earned a BA in economics from California State University and an MBA from Claremont Graduate University. 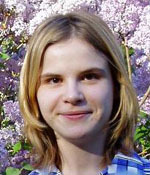 Veronika was a Mercatus Center Adam Smith Fellow.